If you keep your PC in sleep mode a lot, then you might want to stop your mouse from waking up your computer when it gets an accidental bump from your pet or children. Whether at home or office this feature that wakes up pc from sleep mode when there is any mouse movement can be quite annoying since even the slightest touch on the mouse can wake-up your computer from its well deserved beauty sleep. Step 1 : Go to Start > Control Panel and search for "mouse" and click on "Change mouse settings" from the results. 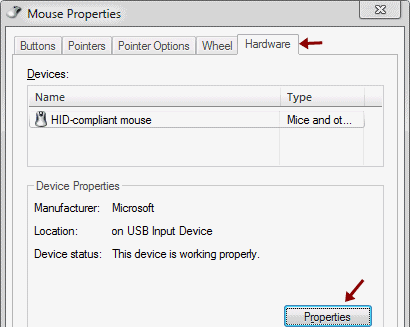 Step 2 : It opens the "Mouse Properties" window. Click on the Hardware tab and click on "Properties". Step 3 : From the Properties window go to the "Power Management" tab and uncheck the option "Allow this device to wake the computer" and click OK.
You can do the same for your Keyboard, which means you can wake up the computer only by pressing the power button. The same works for windows vista. Windows 7 added these useful power management options controlled by hardware actions, for example you can configure your laptop’s lid settings to perform specific power options when its closed like putting it to sleep mode (default) or do nothing at all. But, in case you might want to disable or lock keyboard and mouse during cleaning them or protect them from your kids, pets while you are away from your desk.